After a brief vacation, the Mildly Alarming Boys come home to the studio rested, rejuvenated, and ready to say a bunch of dumb stuff. First, they take another swing at Hasbro (or maybe Parker Brothers) as they discuss what they might have done differently if they'd made Monopoly. 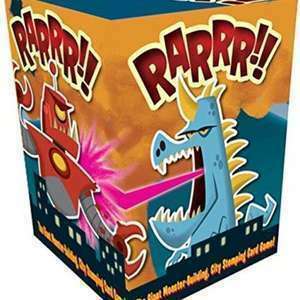 Then it's on to a review of RARRR! !, a card game about giant monsters destroying cities. What do breakfast cereals have to do with it? Nothing. It was just a dumb joke for the title. Love us. You can read what other people think about RARRR!! on BoardGameGeek or purchase a copy for yourself on Amazon.